Shakyamuni Buddha. Image by Jane Seidlitz. What are the Three Jewels? What is guru devotion in the Tibetan Buddhist tradition? What is the essence of the Buddha’s teachings? Why are there many Buddhist traditions? What are the various Buddhist traditions? What does the imagery in tantric art mean? What is the purpose of reciting mantras? Is a mantra an act of faith? I understand mantra can help me, but can it help others as well? His Holiness the Dalai Lama said that the real temple is in the mind and the real philosophy is kindness. If that is true, why are you building so many temples and holy objects? Most of the following questions and answers are extracted from The ABC of Buddhism and I Wonder Why, copyright Ven. Thubten Chodron, found on Amitabha Buddhist Centre’s website. There are many ways to describe who the Buddha is, according to different ways of understanding. These various interpretations have their sources in the Buddha’s teachings. One way is to see the historical Buddha who lived 2,500 years ago as a human being who cleansed his mind of all defilements and developed all his potential. Any being who does likewise is also considered a buddha, for there are many buddhas, not just one. Another way is to understand a particular buddha or Buddhist deity as omniscient mind manifesting in a certain physical aspect in order to communicate with us. Yet another way is to see the Buddha–or any of the enlightened Buddhist deities–as the appearance of the future Buddha that we will become once we properly and completely have engaged in the path to cleanse our mind of defilements and develop all our potentials. Shakyamuni Buddha, the historical founder of Buddhism, was born in India approximately 2,500 years ago. Shakyamuni Buddha was the son of Shuddhodana, the king of the Shakyas, a small tribe whose kingdom was located in the foothills of the Himalayas south of what is now central Nepal, fifteen miles from Kapilavastu. “Shakya” i is taken from the name of this tribe and “muni” means “sage” or “saint.” His family name was Gautama (Best Cow) and his given name was Siddhartha (Goal Achieved). Seven days after his birth, his mother, Maya, died and he was raised by his mother’s younger sister Mahaprajapati. His mother’s death may have been a great influence upon the delicate youth who later became very perplexed by the question of mortality. His father took good care of his introspective, quiet-mannered son, and gave him special training in literature and the martial arts. As a boy, Shakyamuni was deliberately shielded from the many realities of life, having been brought up amid the pleasures of the royal palace. It was natural for his family to expect that he would take over as the leader of his tribe and succeed his father. 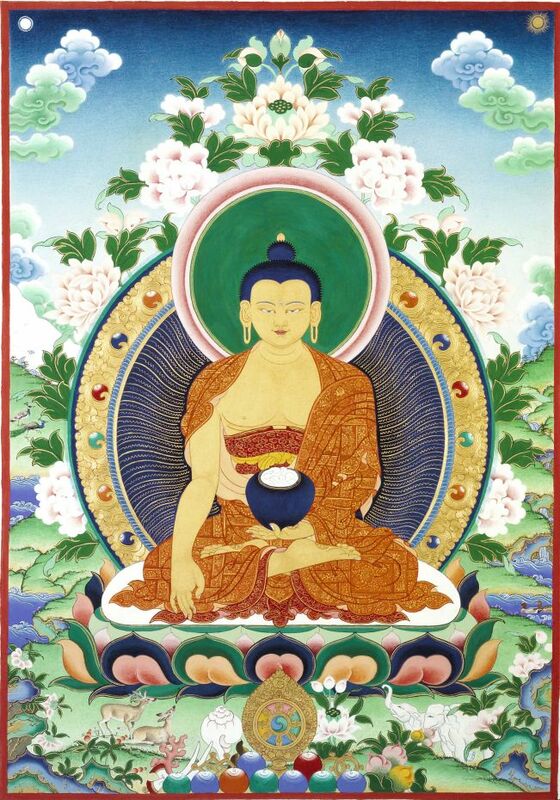 Although his family had such expectations for him, Shakyamuni was extremely introspective and quiet as a youth, possessing a sharp sense of justice and seeking the answers to life’s perplexing questions. It is said that he ventured out of the palace compounds on a number of occasions as a youth and each time was confronted with the sufferings of life. On one such occasion he came upon a very old man. On another venture he met a sick man, frail and burning with fever. On yet another journey, he was impressed when he met a wandering monk (bhikshu) who had renounced the world to lead an austere life in search of spiritual enlightenment. And again on another occasion he saw a person dead in the street. These events are recounted in the Buddhist scriptures as the four meetings. He was said to have been deeply moved by these confrontations with human suffering. Knowing his son’s tendency toward deep introspection and his desire to seek a spiritual path, his father sought to tie him down to life within the confines of the palace and their land. Marriage seemed a way to dissuade the young prince from pursuing the life of an ascetic, so at the age of sixteen, the young prince married the beautiful Yashodhara who bore him a son, Rahula. 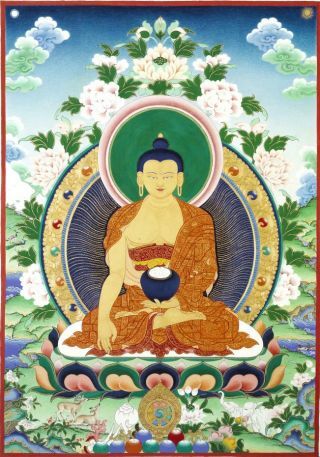 Following the birth of his son, Shakyamuni could no longer repress the resolve he felt to abandon the secular world and go out in search of a solution to the four inescapable sufferings of birth, old age, sickness, and death. Siddhartha renounced secular life and his princely status around the age of nineteen and began living a religious life. Having left the palace of the Shakyas at Kapilavastu he traveled to Rajagriha, the capital of the kingdom of Magadha, where he studied with various ascetics, however, after following their disciplines, he still could not find the answers to his questions. He then left Rajagriha and proceeded to the bank of the Nairanjana River near the village of Uruvilva, where he began to practice various austerities in the company of other ascetics. He subjected himself to disciplines of extreme severity, surpassing the efforts of his companions, trying to reach emancipation through self-mortification, but after six years he rejected these practices as well. To restore his strength from having fasted for such a long time he accepted milk curd offered to him by Sujata, a girl of the village. Then, near the town of Gaya, he sat under a pipal tree and entered meditation. There he attained enlightenment at the age of thirty. The pipal tree was later called the bodhi tree because Shakyamuni gained bodhi or enlightenment under this tree, and the site itself came to be called Bodhgaya. After his awakening, Shakyamuni remained for a while beneath the Bodhi tree rejoicing in his emancipation. Shakyamuni contemplated how he should communicate his realization to others. It is said he questioned whether or not he should attempt to teach others what he had achieved. He finally resolved to strive to do so, so that the way to liberation from the sufferings of birth and death would be open to all people. First he made his way to the Deer Park in Varanasi, where he preached the Four Noble Truths to five ascetics who had once been his companions. Over the next fifty years from the time of his awakening until his death, Shakyamuni continued to travel through many parts of India disseminating his teachings. During his lifetime his teachings spread not only to central India but also to more remote areas and people of all social classes converted to Buddhism. The Three Jewels are the Buddha, Dharma and Sangha. Buddha is one who has purified all the defilements of the mind the afflictive emotions, the imprints of the actions motivated by them, and the stains of these afflictive emotions and who has developed all good qualities, such as impartial love and compassion, wisdom knowing all existence, and skillful means of guiding others. The Dharma embodies the preventive measures which keep us from problems and suffering. This includes the teachings of the Buddha, as well as the realizations of those teachings the cessations of problems and their causes, and the realizations or paths which lead to those cessations. The Sangha are those beings who have direct non-conceptual perception of emptiness or ultimate truth. On a relative level, Sangha also refers to the ordained people who put the Buddha’s teachings into practice. The Dharma is our real refuge, the medicine we take which cures our problems and their causes. The Buddha is like the doctor, who correctly diagnoses the cause of our problems and prescribes the appropriate medicine. By assisting us in the practice, the Sangha is similar to the nurse who helps us take the medicine. Taking refuge means that we rely wholeheartedly on the Three Jewels to inspire and guide us towards a constructive and beneficial direction to take in our life. Taking refuge does not mean passively hiding under the protection of Buddha, Dharma and Sangha. Rather, it is an active process of taking the direction they show and improving the quality of our life. In FPMT centers, a great deal of emphasis is placed on the practice of guru devotion. Advice Regarding Gurus introduces new students to the concept of guru devotion and explains why such importance is placed on establishing and maintaining a positive relationship with a qualified spiritual teacher. Simply speaking, this is to avoid harming others and to help them as much as possible. Another way of expressing this is, Abandon negative action; create perfect virtue; subdue your own mind. This is the teaching of the Buddha. By abandoning negative actions (killing, etc.) and destructive motivations (anger, attachment, close-mindedness, etc. ), we stop harming ourselves and others. By creating perfect virtue, we develop beneficial attitudes, like impartial love and compassion, and do actions motivated by these thoughts. By subduing our mind, we cut away all false projections, thus making ourselves calm and peaceful by understanding reality. The essence of Buddha’s teachings is also contained in the three principles of the path: definite emergence, the dedicated heart and wisdom realizing emptiness. Initially, we seek definitely to emerge from the confusion of our problems and their causes. Then, we see that other people also have problems, and with love and compassion, we dedicate our heart to becoming a Buddha so that we are capable of helping others extensively. In order to do this, we develop the wisdom understanding the real nature of ourselves and other phenomena. The Buddha gave a wide variety of teachings because sentient beings (any being with mind who is not a Buddha, including those in other realms of existence) have different dispositions, inclinations and interests. The Buddha never expected us all to fit into the same mould. Thus, he gave many teachings and described various ways of practicing so each of us could find something that suits our level of mind and our personality. With skill and compassion in guiding others, the Buddha turned the wheel of Dharma three times, each time setting forth a slightly different philosophical system in order to suit the various dispositions of sentient beings. The essence of all the teachings is the same: the wish definitely to emerge from the cycle of constantly recurring problems (samsara), compassion for others and the wisdom realizing selflessness. Not everyone likes the same kind of food. When a huge buffet is spread before us, we choose the dishes that we like. There is no obligation to like everything. Although we may have a taste for sweets, that does not mean that the salty dishes are not good and should be thrown away! Similarly, we may prefer a certain approach to the teachings: Theravada, Pure Land, Zen, Vajrayana, and so on. We are free to choose the approach that suits us best and with which we feel the most comfortable. Yet we still maintain an open mind and respect for other traditions. As our mind develops, we may come to understand elements in other traditions that we failed to comprehend previously. In short, whatever is useful and helps us live a better life, we practice, and whatever we do not yet understand, we leave aside without rejecting it. While we may find one particular tradition best suited for our personality, do not identify with it in a concrete way: “I am a Mahayanist, you are a Theravadin,” or “I am a Buddhist, you are a Christian.” It is important to remember that we are all human beings seeking happiness and wanting to realize the truth, and we each must find a method suitable for our disposition. However, keeping an open mind to different approaches does not mean to mix everything together at random, making our practice like chop suey. Do not mix meditation techniques from different traditions together in one meditation session. In one session, it is better to do one technique. If we take a little of this technique and a little from that, and without understanding either one very well mix them together, we may end up confused. However, a teaching emphasized in one tradition may enrich our understanding and practice of another. Also, it is advisable to do the same meditations daily. If we do breathing meditation one day, chanting the Buddha’s name the next, and analytical meditation the third, we will not make progress in any of them for there is no continuity in the practice. Generally, there are two divisions: Theravada and Mahayana. The Theravada lineage (Tradition of the Elders), which relies on sutras recorded in the Pali language, spread from India to Sri Lanka, Thailand, Burma, etc. It emphasizes meditation on the breath to develop concentration and meditation on mindfulness of the body, feelings, mind and phenomena in order to develop wisdom. The Mahayana (Great Vehicle) tradition, based on the scriptures recorded in Sanskrit, spread to China, Tibet, Japan, Korea, Vietnam, etc. Although in the Theravadin practice love and compassion are essential and important factors, in the Mahayana they are emphasized to an even greater extent. Within Mahayana, there are several branches: Pure Land emphasizes chanting the name of Amitabha Buddha in order to be reborn in His Pure Land; Zen emphasizes meditation to eliminate the noisy, conceptual mind; Vajrayana (Diamond Vehicle) employs meditation on a deity in order to transform our contaminated body and mind into the body and mind of a Buddha. Vajrayana deals a lot with transformation, and therefore, symbolism is widely used. There are representations of some deities, which are manifestations of the Buddha, that are expressing desire or wrath. The sexual imagery is not to be taken literally, according to worldly appearances. In Vajrayana, deities in sexual union represent the union of method and wisdom, the two aspects of the path that need to be developed in order to attain enlightenment. Wrathful deities are not monsters threatening us. Their wrath is directed toward ignorance and selfishness, which are our real enemies. This imagery, when properly understood, shows how desire and anger can be transformed and thereby subdued. It has deep meaning, far beyond ordinary lust and anger. We should not misinterpret it. Mantras are prescribed syllables to protect the mind. What we want to protect our mind from are attachment, anger, ignorance, and so on. When combined with the four opponent powers, mantra recitation is very powerful in purifying negative karmic imprints on our mindstream. While we recite mantras, we should also be thinking and visualizing in a beneficial way so that we are building up constructive habits in the mind. In the Vajrayana practice, mantras are recited in Sanskrit, rather than being translated into other languages. The reason for this is that there is a special beneficial energy or vibration that is induced by the sound of the syllables. While doing recitation, we can concentrate on the sound of the mantra, on its meaning, or on the accompanying visualizations that the master has taught. A mantra is an example of speech that can be directly experienced. Many attributes of mantras cannot be verified by ordinary persons’ direct perception or inference. Such attributes are relied on by virtue of scriptural authority. Scriptural authority is verified by examining documentation, lineages, and tradition, as well as reasoning. Reasoning is used to determine if there is consistency of what was said (i.e. a scriptural statement is not contradicted by other scriptural statements), and is not contradicted by direct perception or logic. There are functions of mantra that may be initially relied on by the power of faith that are later relied on by one’s own experience. For example, a person may recite a mantra initially because his or her teacher recommended it. Later, during or after recitation, the practitioner discovers that mantra recitation was an effective method for concentrating the mind. In the future, the practitioner recites the mantra to concentrate the mind, because of appreciating this particular value directly experienced. The same can be said of other positive experiences obtained through the recitation of mantra. According to scripture and commentaries, as provided to me by my teachers, the recitation of mantras, such as “manis” actually benefits other beings. As I have no reason to doubt my teachers, I recite those mantras with the intention of benefiting others. There are practitioners who testified with their personal experience the effectiveness of reciting mantras for the welfare of others. As one person succeeded, and others applied the method and succeeded as well, I’d say the effectiveness of mantras was scientifically proven. However, to satisfy your concern, I believe the only recourse is for you to find out how to recite mantras as those successful practitioners did, and apply the method assiduously, just as they did. This is the scientific method. graduated with great honors and was among the top of his class. It is primarily a title referring to academic excellence and degree of training in the Buddhist philosophical texts. “Rinpoche” means “precious” and refers to someone who in their last life attained such a high degree of mastery that they did not have to take any more rebirths. However, out of their compassion for others, they took another birth at will – or rather took a human form – in order to teach others. Hence, they are “precious” because they returned to show us how to do it ourselves. “Venerable” is a term for those who are ordained. Any monk or nun is traditionally referred to as “venerable”. It is simply a term of respect for those who have chosen the monastic life and have taken it upon themselves to preserve the teachings in this way. “Lama” means literally “heavy with qualities”. It is a title which implies that the person who is the referent of this term has demonstrated spiritual qualities and the ability to lead others in their spiritual life and path. There are some Tibetan Buddhist traditions where you can “earn” the title “lama” after doing a certain amount of retreat and study. In other traditions, one must earn the title “lama” by way of demonstrating their qualities over the years – or because they have been recognized clearly as a “Rinpoche” – and then are a “lama” by definition! You have a really good question! I think we have to take context in which His Holiness the Dalai Lama was speaking, and also remember that great teachers like His Holiness always teach to the students at hand. Therefore, they may say or do things that look contradictory on the surface, but with deeper analysis, we can see there is actually no contradiction. His Holiness was speaking to an organization that is dedicated to bringing the principles of Buddhism into the larger society, without its religious trappings (the Foundation for Developing Compassion and Wisdom). We all understand what Buddhism teaches on compassion, loving-kindness, peace is very much needed in the larger world. Because the Dharma is so flexible, it can be taught in an entirely non-religious context. For some people, this is very much needed and this is the only way they can relate to these ideas. This is not to say that this presentation is inferior in any way – it’s not at all! It’s just that Lama Yeshe and Lama Zopa Rinpoche (who founded FDCW) and also His Holiness are using their skillful means to help sentient beings in the best way. Then there are people who respond very much to temples and beautiful holy objects like prayer wheels and statues. Even a lot of people who are non-Buddhist respond well to these things, and certainly a lot of people who are practicing Buddhists really find inspiration in these things. They uplift the mind and help us remember what we are trying to do. They offer support for our practice. And it is said in the teachings that even seeing a Buddha statue or a stupa plants the seed in the mind for future liberation and enlightenment. Even if you don’t have faith, this is true. Lama Zopa Rinpoche says it is like electricity – you don’t have to believe in it for it to work. Turning on a switch and having an electric light come on is not dependent on your faith in electricity. This is just how it works. Holy objects have a similar power to create enlightenment. Therefore, it is also really important to have holy objects. His Holiness is very supportive of such things, and has actively endorsed FPMT’s Maitreya Project, which will build a 500-foot statue of Maitreya and also provide top rate education and medical help for the people in that part of India. You can see a short video about this project and His Holiness’s explanation for why it is important here. So we have these two ideas that seem contradictory – no need for temples and complicated philosophy, and then lots of temples and things like that being built. But when you examine closely, you will see that there is no contradiction. His Holiness is completely correct – the real practice is in the mind and as one other teacher said, all you really need is kindness. But for many people, the temples and holy objects help move the mind in the right ways and inspire us to practice kindness. They support the inner temple of the mind and the outer practice of kindness. That said, they are just supports. In this way, there is no contradiction between what His Holiness said and building actual physical temples. We should train ourselves not to become engrossed in any of the thoughts continuously arising in our mind. Our consciousness is like a vast ocean with plenty of space for thoughts and emotions to swim about and we should not allow our attention to be distracted by any of them.